Solar Solutions Inc. is happy to benefit from its’ partnership with UMA-Solar and Centrosolar America to bring the most efficient solar power solutions available for residential and commercial applications. Centrosolar America Inc. is a wholly-owned subsidiary of CENTROSOLAR Group AG, headquartered in Munich, Germany. CENTROSOLAR Group AG is one of the leading publicly traded solar companies, with revenues of $540 million in 2010 and more than 1,000 employees in 21 locations. Centrosolar has production facilities in Germany, USA and China for its PV modules and components like solar glass. Centrosolar panels are manufactured with the highest performance and most reliable solar cells in the industry. Recognized for its ability to deliver lifetime performance and maximize kWh yield, the modules contain top-brand EVA chemical resistant and flame retardant back sheet, and high-transparency, impact-resistant glass to ensure efficiency over time. Engineered to perform in harsh climates like ice, hail, snow, high wind, humidity and extreme ambient temperatures, the modules carry a five-year workmanship and materials warranty and a power warranty for 25 years at 85% and 12 years at 90% of minimum peak power. Photovoltaic (PV) is a technology that converts light, directly into electricity. To explain the photovoltaic solar panel in simple terms, the photons from the sunlight knock electrons into a higher state of energy, creating direct current (DC) electricity. In the solar panels the DC current is sent to an inverter to convert the DC current to AC current to meet our every day electrical needs. A quick disconnect is provided between the panel array and the inverter and between the inverter and breaker box. This first week of 2016 is making Power Our El Paso Electric has Credit My 9kW has allowed our home to install Electric range reducing our Gas Bill and now when the sun shines on my roof my EPEC meter goes down. Gad and his Team have changed our World. Thank you Solar Solutions. 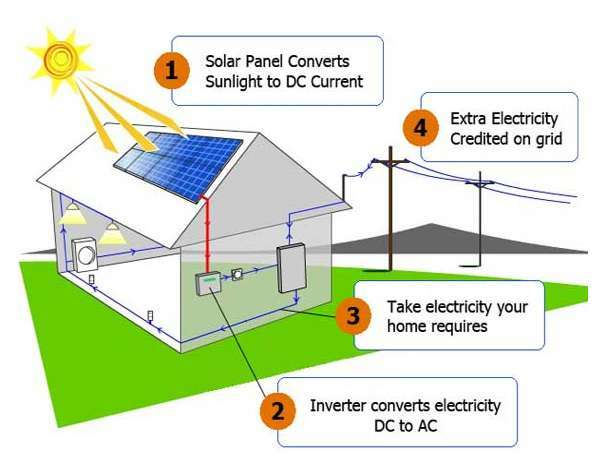 Solar solutions is the only company I would use to install a solar power system on my home. They are also the only company I would recommend to anyone. Gad and his team are very professional. His team took great care of our needs and the system they installed works perfectly. Gad and his staff are very professional. We have had 8kWh since the summer of 2014 on our residence and have received an drastic reduction in our utility bill, as well as reimbursements from EPEC. The only downfall is the monopoly that EPEC has in the West Texas area. (If only there were a way to remove ourselves from the grid and install large batteries collect our electricity.) I highly recommend Solar Solutions to anyone interested in looking at the benefits on solar production.